After a series of shimmery glittery posts, Alison heads us into a more masculine metallic direction with a fantastic wall hanging! 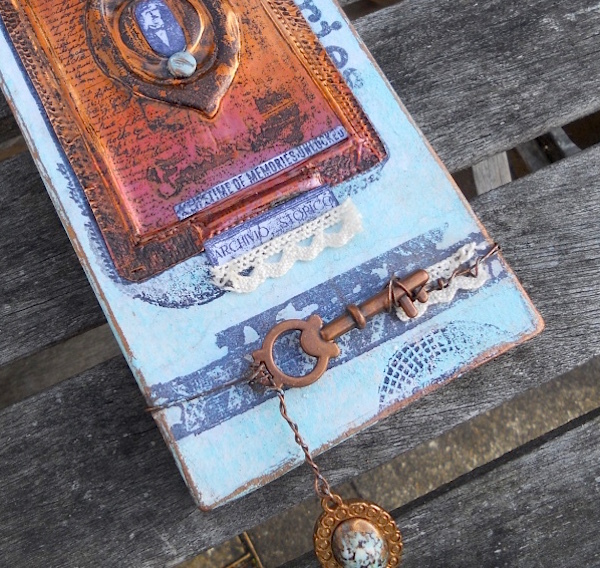 Hi everyone, it's Alison/Craftytrog with you today, and I'd like to share with you a plaque on which I used various metallic elements, the main one being Woodware's Magic Metal Copper Sheet. When heated with a hot plate or heat gun, it turns gradually from copper to deep orange, then pink, then purple, so you can have a variety of colours if you wish. I began by stamping Seth Apter's wonderful collage image from ESA05 onto the copper sheet, using Jet Black Stazon Ink, then used my heat gun to change the colour of the metal, and at the same time to dry the ink. It takes a little while, but it's amazing to see the copper changing colour. Care needs to be taken of course, as the metal gets very hot. On the plaque I started with a base coat of Concrete Fresco Chalk Paint, then wanting to create some texture, I grabbed a piece of scrunched up kitchen towel, dipping it into Antarctic Fresco Chalk Paint and dabbing it on. I then dabbed on some Mermaid Fresco Chalk Paint. This technique produces a great bit of random texture. I stamped the circle image from ESA05 with Jet Black Archival Ink, going over onto the edges. 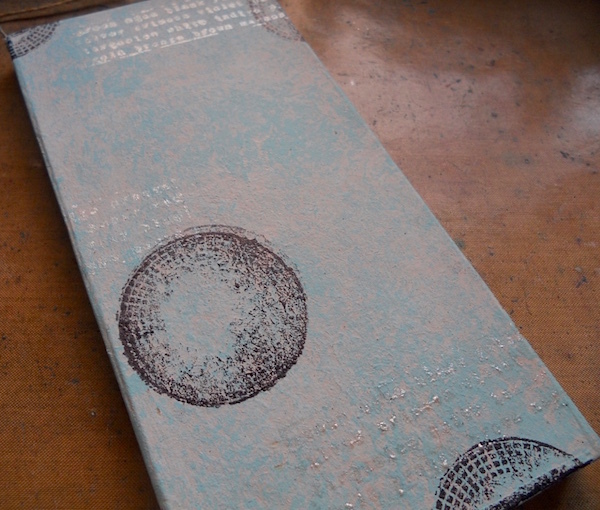 Then I used Metallic Glaze to stamp the writing from ESA04. I love the subtle shimmer of the glaze, another metallic element! 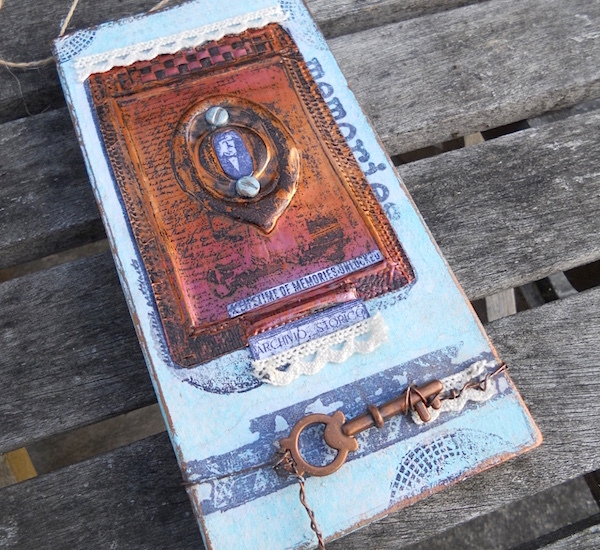 Going back to the copper image, I used metal tools to add texture and dimension. Then to get sharply stamped images of the collage and chevrons from ESA05 on the plaque, I stamped them onto white tissue, then adhered them with Matte Glaze. Rummaging through my stash, I found a copper key, some rusty wire and a bird's egg pendant. Spanish Topaz Treasure Gold accents and cream lace were the finishing touches. I really love the soft texture the lace adds to my piece, contrasting with the metal. I hope I've inspired you to join in with our Metallics Challenge. 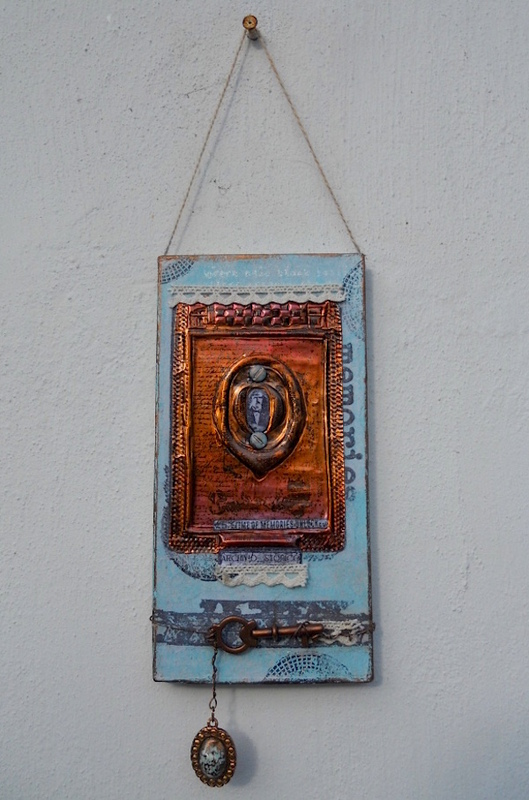 As I've demonstrated, there are many ways to incorporate metallic elements into your art. I've had the copper sheet for a while, and this was the perfect opportunity to play with it. It had been a long time since I used the metal tools too, and I'll be honest, the lace hides a very ugly edge! Lol! Alison, that is gorgeous. I love the copper sheet, what a great idea. what a beautiful piece this is, I love the copper, it sets off Seth's stamp perfectly. This is fabulous Alison! Such lovely tints to the heated copper and it sits beautifully on the colours you chose for the background. I love everything about the piece. 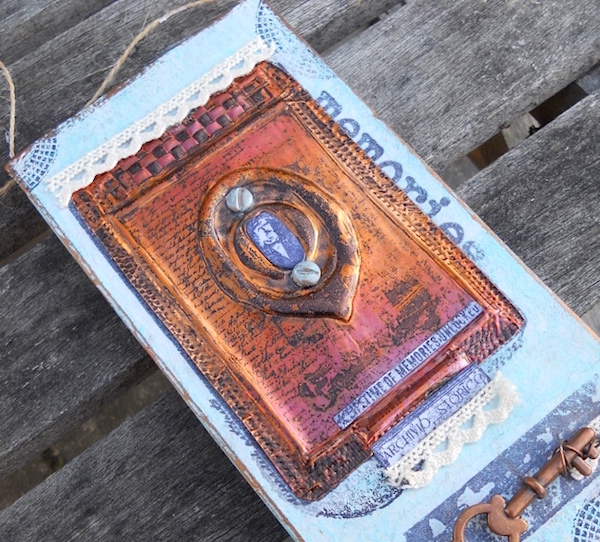 Wowser, great combo of Seth's stamps and copper. Fab creation. I love the copper! Haven't had the chance to try yet but it's on the list... Gorgeous tag! Fantastic project Alison. Loving the copper sheet. Inspiring as always. What a fantastic hanging, Alison - the bold coppery tones of that central panel look amazing against the softer background - beautiful. Fabulous design Alison and a great demonstration of metallics! what wonderful depth you created on this cool image - love all the metallics! Gorgeous metal- love the variance in tone and colour . Fab project! This is incredible Alison! 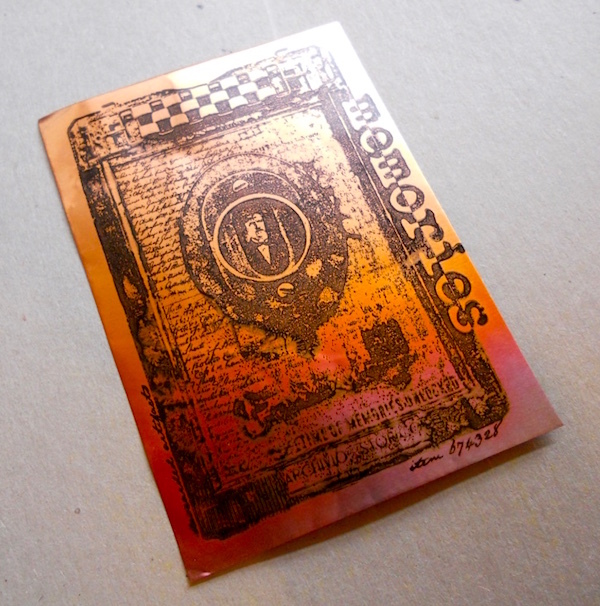 I love the color contrast and how you stamped on a metal piece. Very inspiring! Fabulous project Alison - I love this!